I met this woman recently as she was leaving the local shopping centre. I was impressed by her set-up for shopping by bike. She said she had to shop by bike as she didn’t have a car so had set up her bike and bags acordingly. She doesn’t live far from Kotara Westfield so does not have a long way to carry her shopping. So what do you need to do your shopping by bike? * Check your brakes – there is extra load on the brakes with the extra weight of the shopping so brakes must be really good. * Panniers – they put the load at the rear of the bike and off your back. Of course, front panniers could be used as well or instead of rear ones. This lady also carries an extra shoulder bag of shopping. * Do your shopping in small increments – it is more manageable and your food will be fresher. * Shop locally – you are supporting local businesses and, if you shop wisely, can avoid purchasing goods which have been transported long distances, thus lowering your carbon footprint. Kotara shopping centre is very well serviced with offroad bike tracks and many more locals should be taking advantage of them and using their bikes to get there. I personally know of many offenders here! The way we manage our shopping it to do much of it at the local suburban shops and to have a box of vegetables delivered every week. The local butcher’s meat is much better than anything to be had at one of the Big Two supermarkets and our fruit is also much fresher. We also grow some herbs and veges for added freshness and better flavour. I make occasional purchases at the large supermarkets but that is all, usually to get something that cannnot be had locally. I use the basket on my bike and a small backpack to carry the groceries, that is sufficient. It is a huge improvement on quality of life, I can assure you. 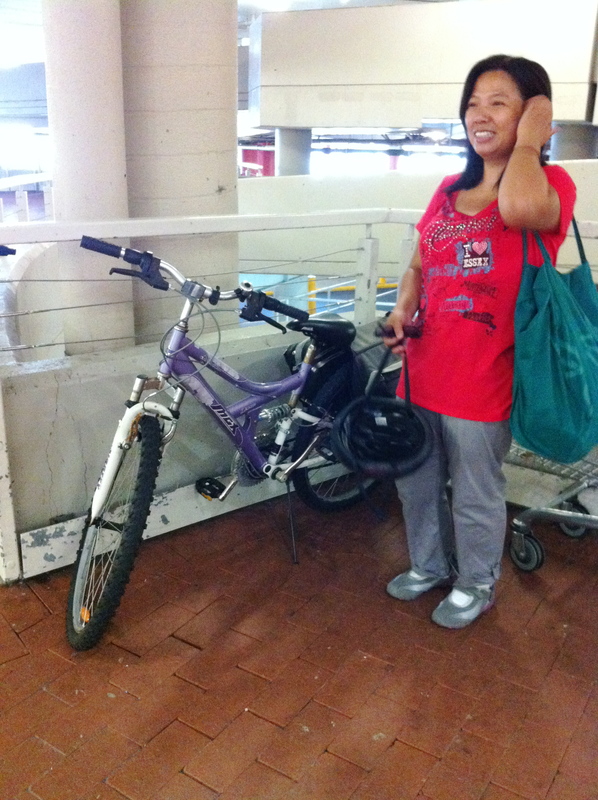 This entry was posted in Uncategorized and tagged Kotara, newcastle, women on bikes. Bookmark the permalink.